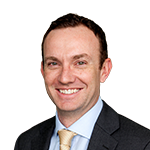 Any movement towards key global rate normalisation is likely to affect bond markets. Unconstrained multi-asset credit (MAC) strategies have historically performed well in periods of interest rate volatility. 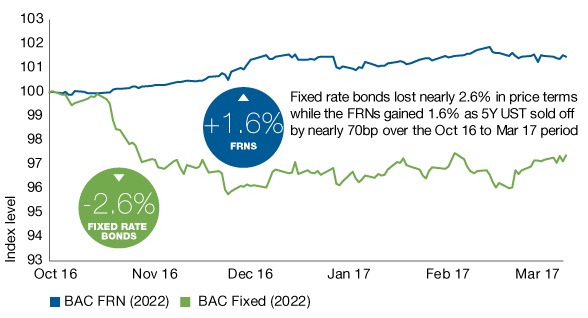 Within MAC strategies, credit spreads are significantly more important than duration in determining performance. Credit spreads are negatively correlated to interest rates, helping to dampen any rate sensitivity. Access to a wide variety of instruments allows for the construction of portfolios which have the potential to perform well through varying market conditions. The US Federal Reserve (Fed) is embarking on a rate hiking cycle and the European Central Bank (ECB) is slowing the pace of Quantitative Easing (QE), raising concerns about the impact of higher rates. In our view, while the likelihood of a normalisation of rates to long-run averages from today’s levels seems low, any movement in that direction will likely have a significant impact on bond markets. Even if full normalisation is not a near-term phenomenon, interest rate markets are bound to go through periods of volatility in reaction to rate-raising rhetoric or action. The strategy is based on unconstrained investing across a broad credit opportunity set, looking for the most attractive risk-adjusted return, while giving the manager flexibility to manage the strategy through different market conditions. The nature of that broad opportunity set is a key element in the construction of a robust and non-rate-sensitive portfolio. For example, sub-investment grade credit, particularly high-yield and leveraged loans, has a strong track record through such periods. Source: Barclays, Bloomberg, Investec Asset Management. Benchmarks and time periods as follows: USD IG: Bloomberg Barclays US Corporate Index (31.01.86 - 30.03.17), USD HY: Bloomberg Barclays US Corporate High Yield Index (31.01.91 - 30.03.17), USD Loans: S&P/LSTA Leveraged Loans Index (31.12.96 - 30.03.17). Duration is an overly simplistic and one dimensional measurement. In essence, duration measures the sensitivity of the portfolio to changes in underlying interest rates. If the portfolio has a duration of 3.5 years, then its value is expected to fall by 3.5% if underlying interest rates increase by 1%. Importantly, the traditional duration measurement fails to account for moves in credit spreads. For credit markets, the off-setting change in credit spread renders the simplistic predicted price movement of the duration metric far less effective. Indeed, in rising rate environments, credit spreads typically tighten to more than offset any increase in the underlying rates. Source: Bloomberg Barclays US Treasury 5-7 year Total Return Unhedged USD, Bloomberg Barclays US Corporate High Yield Total Return Index Value Unhedged, Bloomberg Barclays US Corporate Total Return Value Unhedged USD. Data between 31.03.16 - 31.03.17. Floating rate instruments (including leveraged loans, high-yield and investment grade floating rate notes (FRN), and structured credit). Fixed rate instruments, including, high-yield bonds, short-duration high-yield bonds, corporate hybrids and bank capital. Synthetic credit instruments, such as default swaps. Just one example, among a variety of possibilities, from the above list is the access to FRNs. This is especially valuable during periods of rising rates, as it allows investors to express a constructive view on the credit without taking the corresponding interest rate risk that is embedded in the fixed rate bonds. 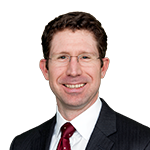 In 2016, a large US bank issued both fixed and floating rate notes with identical maturities. 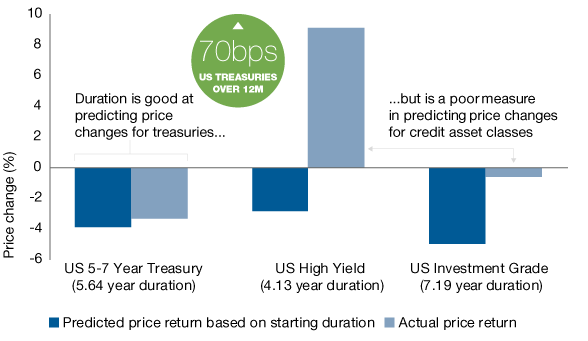 Over the following six months, the yield on 5-year US Treasuries increased by nearly 70bp, causing the fixed rate bonds to fall by 2.6% in price terms. Conversely, the FRNs actually gained 1.6% over the same period, highlighting the ability of FRNs to benefit from credit spread tightening without being hindered by moves in underlying interest rates. This is just one way that an unconstrained MAC portfolio can add value for clients in a rising-rate environment. You can access an in-depth discussion of the complete toolkit in our recent white paper on our website. Multi-Asset Credit – Why now? A Multi-Asset Credit (MAC) strategy can offer a higher yield while controlling risk by diversifying across different credit segments. Interest rates remain on an uncertain path. A MAC approach can have low interest rate risk through the use of loans and high-yield bonds with low duration. With the current unusual market volatility patterns, we believe a flexible and reactive investment strategy has the potential to be far better placed to navigate through different market conditions. Default: There is a risk that the issuers of fixed income investments (e.g. bonds) may not be able to meet interest payments nor repay the money they have borrowed. The worse the credit quality of the issuer, the greater the risk of default and therefore investment loss. Derivative counterparty: A counterparty to a derivative transaction may fail to meet its obligations thereby leading to financial loss. Derivatives: The use of derivatives may increase overall risk by magnifying the effect of both gains and losses. This may lead to large changes in value and potentially large financial loss. Interest rate: The value of fixed income investments (e.g. bonds) tends to decrease when interest rates and/or inflation rises. Liquidity: There may be insufficient buyers or sellers of particular investments giving rise to delays in trading and being able to make settlements, and/or large fluctuations in value. This may lead to larger financial losses than might be anticipated. Loans: The specific collateral used to secure a loan may decline in value or become illiquid, which would adversely affect the loan’s value. Many loans are not actively traded, which may impair the ability of the Portfolio to realise full value in the event of the need to liquidate such assets. The information may discuss general market activity or industry trends and is not intended to be relied upon as a forecast, research or investment advice. The economic and market views presented herein reflect Investec Asset Management’s (‘Investec’) judgment as at the date shown and are subject to change without notice. The value of investments, and any income generated from them, can go down as well as up and will be affected by changes in interest rates, exchange rates, general market conditions and other political, social and economic developments, as well as by specific matters relating to the assets invested in. There is no guarantee that views and opinions expressed will be correct, and Investec’s intentions to buy or sell particular securities in the future may change. The investment views, analysis and market opinions expressed may not reflect those of Investec as a whole, and different views may be expressed based on different investment objectives. Investec has prepared this communication based on internally developed data, public and third party sources. Although we believe the information obtained from public and third party sources to be reliable, we have not independently verified it, and we cannot guarantee its accuracy or completeness. Investec’s internal data may not be audited. Any decision to invest in securities or strategies described herein should be made after reviewing the prospectus and conducting such investigation as an investor deems necessary and consulting its own legal, accounting and tax advisors in order to make an independent determination of suitability and consequences of such an investment. This material does not purport to be a complete summary of all the risks associated with this Strategy. A description of risks associated with this Strategy can be found in the Prospectus or other disclosure document for the fund or Strategy. Copies of such documents are available free of charge upon request. Investec does not provide legal or tax advice. Prospective investors should consult their tax advisors before making tax-related investment decisions. There is no assurance that the persons referenced herein will continue to be involved with investing for this Strategy or Fund, or that other persons not identified herein will become involved with investing assets for the Manager or assets of the Strategy or the Fund at any time without notice. Any description or information regarding investment process or strategies is provided for illustrative purposes only, may not be fully indicative of any present or future investments and may be changed at the discretion of the manager without notice. References to specific investments, strategies or investment vehicles are for illustrative purposes only and should not be relied upon as a recommendation to purchase or sell such investments or to engage in any particular Strategy. Portfolio data is expected to change and there is no assurance that the actual portfolio will remain as described herein. There is no assurance that the investments presented will be available in the future at the levels presented, with the same characteristics or be available at all. Past performance is no guarantee of future results and has no bearing upon the ability of Manager to construct the illustrative portfolio and implement its investment strategy or investment objective. The target is based on Manager’s good faith estimate of the likelihood of the performance of the asset class under current market conditions. There can be no assurances that any Strategy or Fund will generate such returns, that any client or investor will achieve comparable results or that the manager will be able to implement its investment strategy. 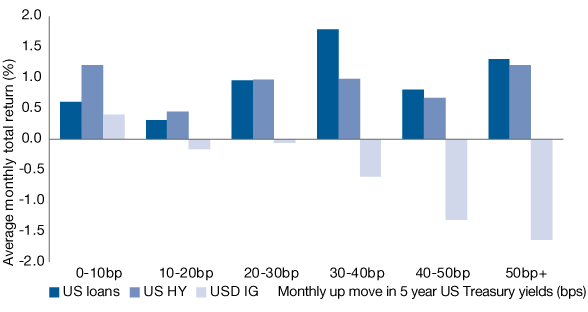 Actual performance of investments and the Fund or Strategy overall may be adversely affected by a variety of factors, beyond the manager’s control, such as, political and socio-economic events, adverse changes in the interest rate environment, changes to investment expenses, and a lack of suitable investment opportunities. Accordingly, Performance Targets may be expected to change over time and may differ from previous reports. References to particular investment or strategies are for illustrative purposes only. Unless stated otherwise, the specific companies listed or discussed are included as representative of the Strategy or Strategies. Such references are not a complete list and other positions, strategies, or vehicles may experience results which differ, perhaps materially, from those presented herein due to different investment objectives, guidelines or market conditions. The securities or investment products mentioned in this document may not have been registered in any jurisdiction. More information is available upon request.